What if you take the power of Google Search with the real-time communication abilities of Facebook and make it work specifically for professionals? That's exactly what it's like to leverage LinkedIn's extraordinary internal search engine, which indexes data points on its 500 million users. Far too few of the platform's users understand the hidden treasure of LinkedIn's Advanced Search features, which allow you to instantly create a targeted list of your ideal B2B prospects with a few clicks. I'm going to explore a few of them with the rest of this post. If you follow the simple steps I've outlined below, you'll walk away with a fast, easy, and efficient way to generate more sales leads than you know what to do with on the world's largest platform for professionals. As someone who has spent the past five years showing others how to generate new business with LinkedIn, I still meet people each day who had no idea what's possible on the platform. If you're in that camp, prepare to have your eyes opened -- wide! Start by typing in the job title of your ideal prospect. It might be "business coach" or "chiropractor" ... even if your ideal prospect could be anyone, begin by niching down to a target audience where you've had experience or success. On LinkedIn, the #1 rule of sales and marketing is this -- the riches are in the niches! Once you've chosen a job title and gotten your initial search results, choose "People," and use the filters on the right side of the page to narrow this list even further. 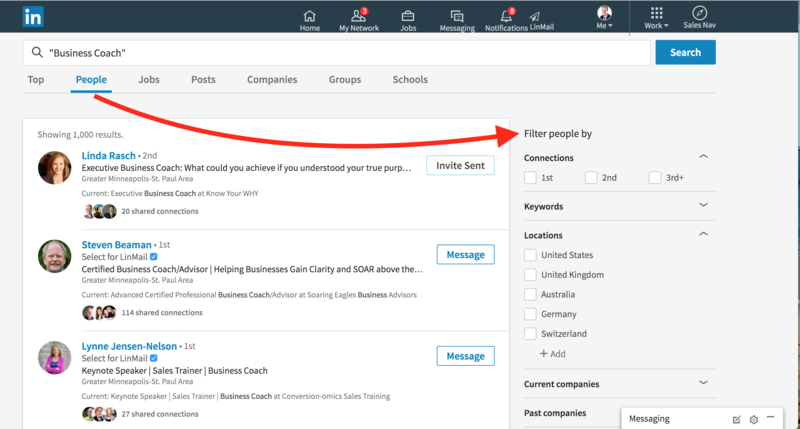 TIP: If you filter this list down to 2nd-level connections, you can send that group of potential customers invitations to connect. Here's where you get strategic. Based on your search filters, you can drill down to where someone lives, went to school, their industry, and so on. You take that information and personalize your invitations and messages accordingly. Hey [insert name] -- I see you live in the Windy City! It's my favorite town; I actually lived there for 10 years. I'm a copywriter here in the Twin Cities now and I am just looking to connect with marketers like yourself here on LinkedIn! You think the Cubbies have a team this year -- or are you a Sox fan like my husband? The trick is to not only personalize, but to also find a way to ask about where they live, or about the weather in their city as part of your invite. This begins an easy dialog that has nothing to do with work, breaking the ice and getting the relationship off on the right foot. Use these scripts as a quick and easy way to personalize a batch of invites based off your search filters, with a quick copy and paste. To send a personalized note with each connection request, you have to click "Add a Note." You can do this one at a time for each person on your list, and within a few minutes you can send out 5-10 personalized invites to people based on those search filters. Always, always, always do one-on-one personalized marketing when you're connecting with new leads. I can't say this enough: Personalization is key to success for lead generation on LinkedIn! LinkedIn's internal search engine is immensely powerful, and yet many members still don't realize it or don't use it this way. As a result, you can get ahead of your competition and add a huge funnel of prospects. What's more, with LinkedIn's new messaging features, you can instantly launch into a real-time chat with your new connections as good as any face-to-face coffee meet-up! These conversations on LinkedIn can give you the opportunity to -- at the right time -- ask to share a relevant blog post you've done, or some other way to bring value to the relationship as you build toward a transaction. If you're not using LinkedIn's Advanced Search like this already, take the steps I've outlined above and get going!